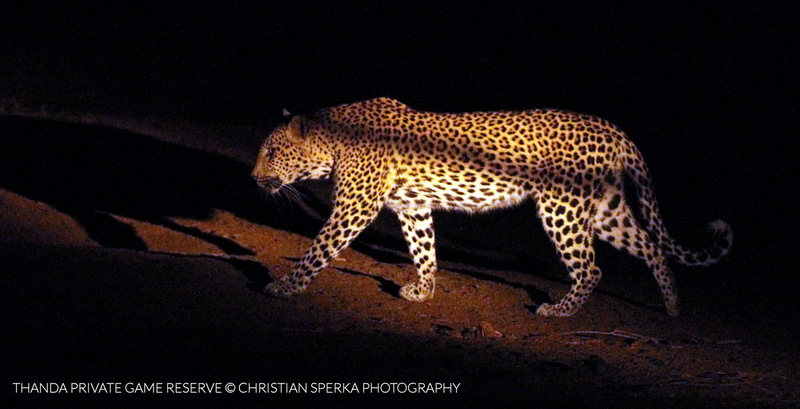 Three leopards – one kill! 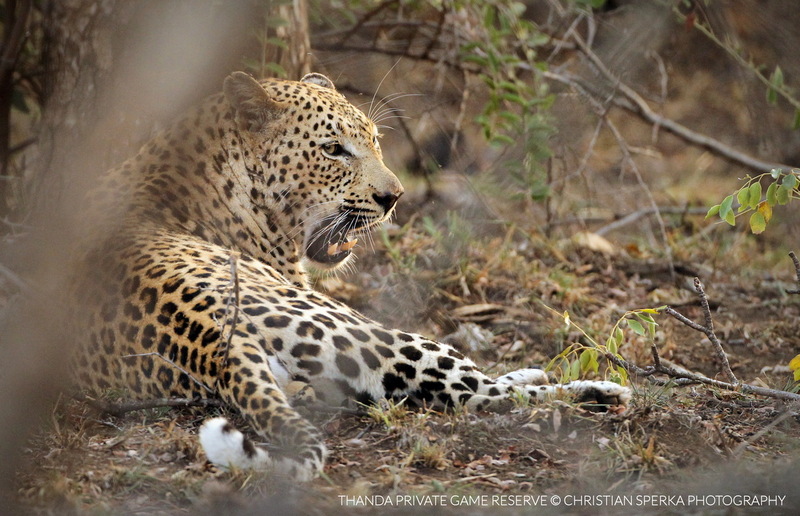 Not one, not two, but three adult Leopards were competing for the same kill. A large Warthog had been killed by one of them. When the human observers arrived the larger of two males was feasting on the main part of the Warthog. The female had taken her share into a tree and was eating there while the third cat, a smaller male, hung around in the area, obviously agitated at missing out on the food. He even gave the game viewing vehicle a bit of a warning charge before he settled down and waited for his turn. 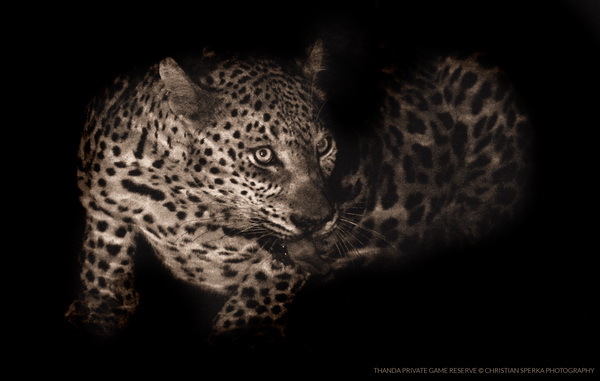 This incredible situation was observed by all guests on game drive before everyone returned excited to the Thanda Safari Lodge, the Thanda Tented Camp and to Villa iZulu for their own dinners. And it was even more astonishing when all three cats were still in the area the next evening. 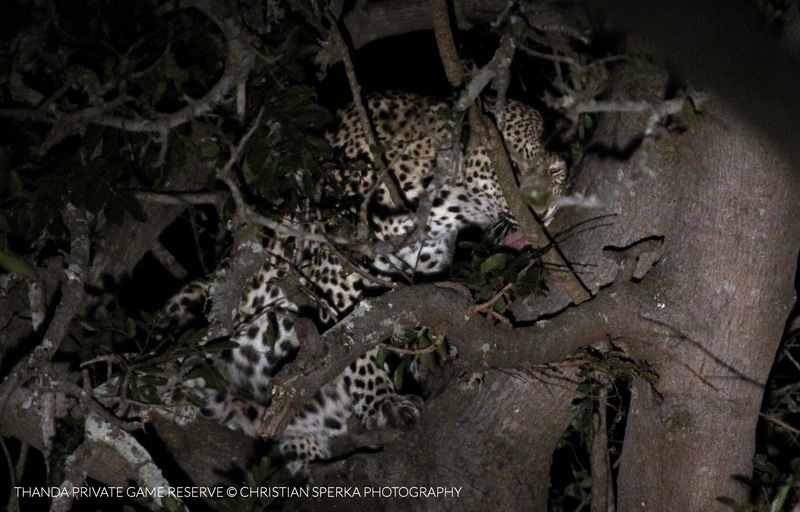 During the final stages of the Leopard dinner a young Spotted Hyena moved in very quickly, stole a piece of meat and disappeared into the bush before the Leopards were able to react. What fabulous sightings: Three of these – usually solitary – animals were hanging out together to benefit from a large kill. And all of this was observed because an experienced guide and excellent tracker read the bush signs correctly – given by a small Jackal! The larger of the two males resting in between bites! What a beauty! … and then crossed the road in front of the vehicle to hide in the bush. Pure excitement! 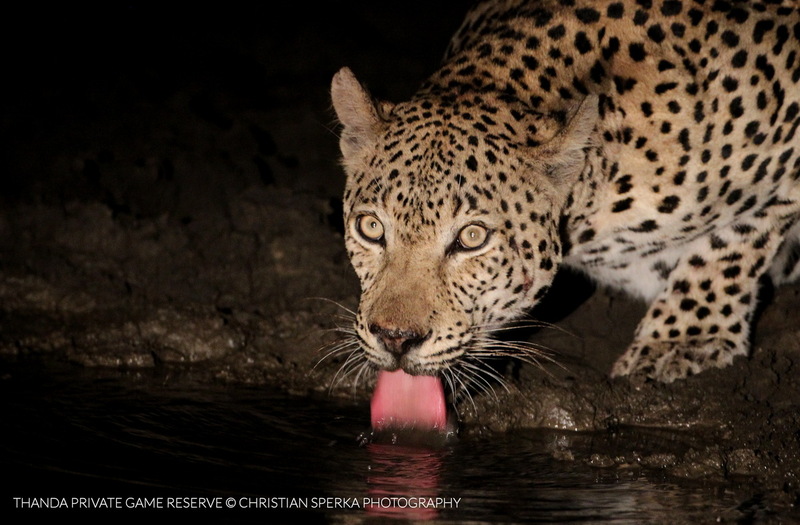 … after she returned from a drink at the nearby waterhole. The larger male having a drink while the female returned to the kill. And last but not least, the larger of the two males eating, just before the Hyena moved in to steal a bit of the kill (unfortunately my camera was focused on one of the other cats when this happened – Mr.Murphy live!). PS: For the photographers among you: These images were taken from before sunset into the dark night (using spotlight). This accounts for the various color variations in the images. I did not correct for this, as this is how they appear to the human eye. As a photographer, all I can say is Wonderful! Spectacular images, many thanks to all involved.